1 high-ranking music artist will be selected to participate in a mentor session with Ken Weinstein, the President of Big Hassle Media, at the forefront of the music industry publicity business - from breaking the likes of bands as divergent as The Strokes and Fountains of Wayne, to taking the media reigns for established artists including B.B. King, Incubus and Dave Matthews Band. 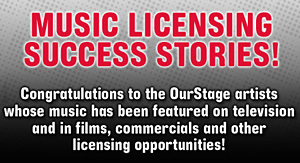 Artist selection will be made jointly by OurStage's editorial team and the staff at Big Hassle Media; All high-ranking music artists from November are eligible.